Why was there a need for a change in this Guisborough Kitchen? This unusual Guisborough kitchen is at the front of the house. The Robson’s had already spoken with their builder and had the plans outlining the changes they wanted to make. The idea was to extend at the front of the house and make the kitchen a much larger space adjoining to a family area. When the Robsons brought the plans in to Michael, the designer at Court Homemakers, he listened to their ideas. The new space was large and although the Robsons wanted to maximise storage they also wanted a space that felt light and airy. Their idea was to separate the two rooms in some way, so the different functions were evident, while still giving them an open plan feel. 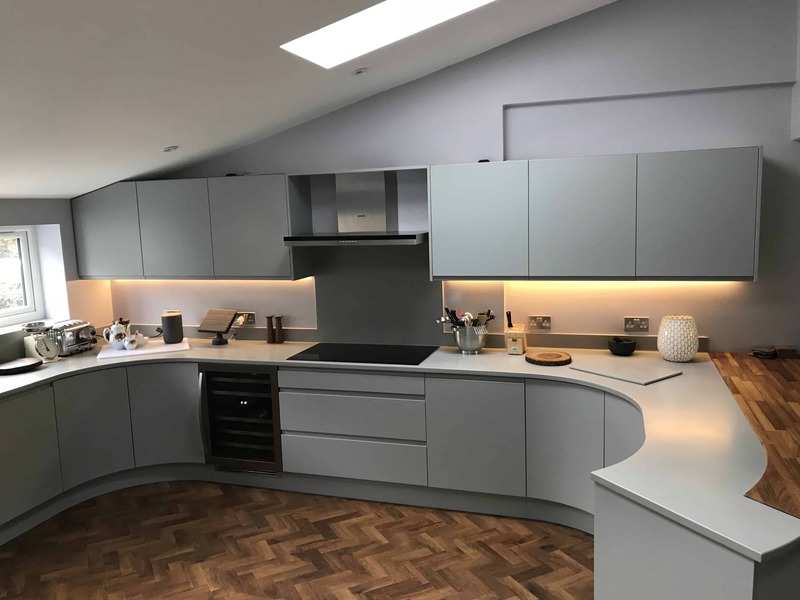 The area was already well lit with skylights so down-lighters were added to the ceiling and below the cupboards to highlight the Corian work-surfaces that were fitted in Dove Grey. 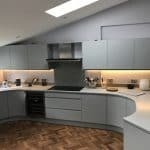 Grey is very on trend at present and when combined with the Remo Matt Silver door design gave the Robson’s exactly the finish they were hoping for. The look they had wanted was modern, clean lines with a light and airy feel and that was exactly what was achieved. From the Robsons perspective what are the stand-out/favourite features and why? 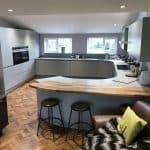 Mrs. Robson loves the contrast between the clean lines of the kitchen cupboards/work-surfaces and the solid wood Iroko breakfast bar/Karndean Oak Parquet flooring. While Mr Robson, who does most of the cooking, adores the amount of storage space available and the breakfast bar. Therefore, allowing him chat with everyone while preparing meals/entertaining. The whole area just works for them! Why did they choose Court Homemakers? With a large project like this the Robson’s wanted a company that would be able to take care of everything, the whole project, from start to finish (once the builder had left). Said Mrs. Robson “We knew Court Homemakers could do it all and they did; they helped us to work out what we really wanted and needed from the space and then delivered it. We would definitely recommend the quality of their work and are really pleased with the job they have done for us”.